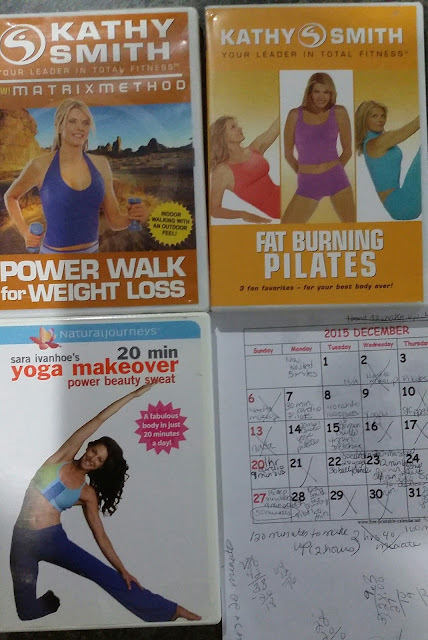 Heartfelt Balance Handmade Life: December Fitness Update- Did I Meet My Goals? December Fitness Update- Did I Meet My Goals? December is all but done by this point! At the beginning of December I set a goal for myself to do yoga and/or Pilates every day except for Christmas Eve and Christmas day. The challenge quickly changed into JUST doing some kind of fitness activity daily. On the days that I didn't work out, I "charged" myself 20 minutes and started a tally for each 20 minute session that I needed to make up. At one point I had about 2 -3 hours that I needed to make up. During the Holiday season I wasn't sure I was going to be able to do it. By the beginning of last week or the beginning of this week I had made up all of my minutes and I thought I was going to finish the month strong! I did well on Sunday and Monday, but ended up skipping Tuesday and Yesterday. Thankfully I did 50 minutes each day Sunday and Monday, so I was actually ahead! Here's a look at the DVDs that I used this week. Apparently, it was a Kathy Smith week. This Fat Burning Pilates DVD is different than my Denise Austin Pilates DVD. It's interesting to see the differences in the ways that they teach you the Pilates basics. Kathy Smith has her Pilates workouts broken down into one session for abs and then a different session for legs. There were points during the leg workout that I actually wanted to quit. I guess there are some areas of my body that need a lot of work! Even my calves were sore the next day. I need to do this Pilates DVD more often, because it obviously works me a little harder than the Denise Austin Pilates DVD. I also did a Kathy Smith Walk for Weight Loss DVD. I like this one because it doesn't take much space and she uses dumbbells for a little strengthening. There's also a really good 10 minute stretching routine. I'm happy I made my tweaked goals! The object is to stay busy and keep moving until we can begin our next Half Marathon training and until I can begin strength training for real again. I have already printed my calendar and set my goals for January!!! 840 minutes, which is 14 hours and breaks down to 40 minutes each day on 21 days of the month. I was going to break the challenge down further into types of workouts, but I haven't gotten that far yet. It is not written in stone! You never know what I might feel like doing on any given day. Plus, if the weather is ever nice maybe we can fit in an outdoor walk. Have you made your January fitness goals? Subscribing from Friendship Friday at Create With Joy. The most fit I think I ever was happened 30 years ago. I started at 5 minutes on a stair climber - yes I was that out of shape. Well, I upped my time in 5 minute increments (weekly) until I made it up to 45 minutes. Since then I've had a hard time keeping a regular fitness routine. My fitness goals for this year are to work out at least 3 times a week. I didn't break it down into monthly, but that is a good idea. I have completely not done good so far on my work-out goals, but am doing pretty good in other areas. Thanks so much for linking up to Fitness Fridays on Drops of Learning. I hope to see you back tomorrow, and I look forward to following your fitness journey!